The first step to an organized kitchen is to develop work stations. Having your kitchen organized in this way results in making your kitchen work for you and not against you! We want to help you take the fewest steps to get what you need and all the cooking and cleaning becomes a breeze and even enjoyable! OK! So lets take a look at how to arrange your kitchen into stations for the most convenient way to work! Setting up your food prep station beside the sink is most convenient for easy clean up! In this area you will want to keep your knives, cutting boards, and colanders for rinsing. But, what else do you need at a food prep station? Paper towels are very handy, as well as a nice size bowl to use while you prep food. We use ours for scraps and peelings or rinds and throw it in the garden. Or you can put it in a compost bin or garbage disposal! Especially lemon or orange peels with some vinegar will deodorize your garbage disposal as easy and 1,2,3!! But remember, you will need a few cutting boards to keep on hand so you don’t mixed things up and get cross-contamination. It’s good to have one for your poultry, meat, produce and breads and nuts! 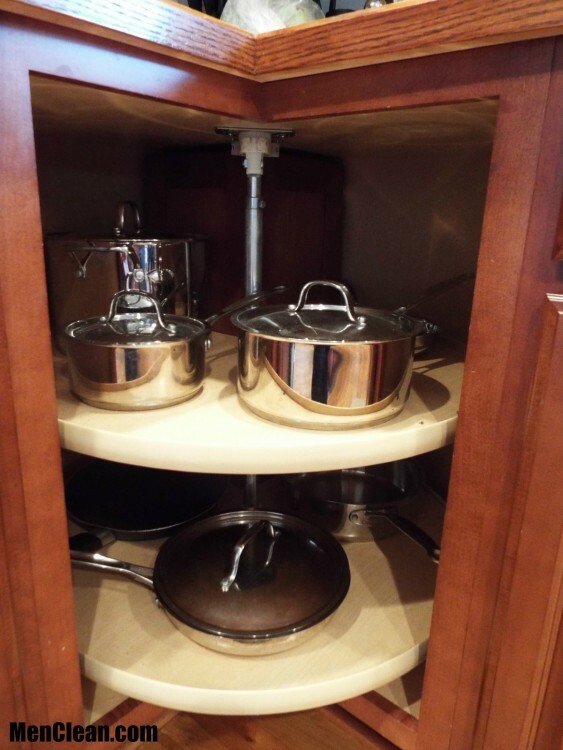 This is where you will want to keep your pots, pans, spatulas, large spoons and hot pads, so they are close for easy access while cooking! If your oven has a storage drawer underneath, use that along with the nearest cupboards that surround it. If your storage is very limited, look into buying clever organizers specifically for cooking equipment. You will find storage units that can hang or mount to the wall or ceiling, inside the cabinets or on the countertops. Or you can also get a small rolling cart to hold all your cooking equipment. Above most stoves there are two small cabinets that can used for seasonings, spices and other oils to grab quickly while you cook. There are several organizers or a trays that can turn to make finding your spices easier too. They are usually plastic and very inexpensive. 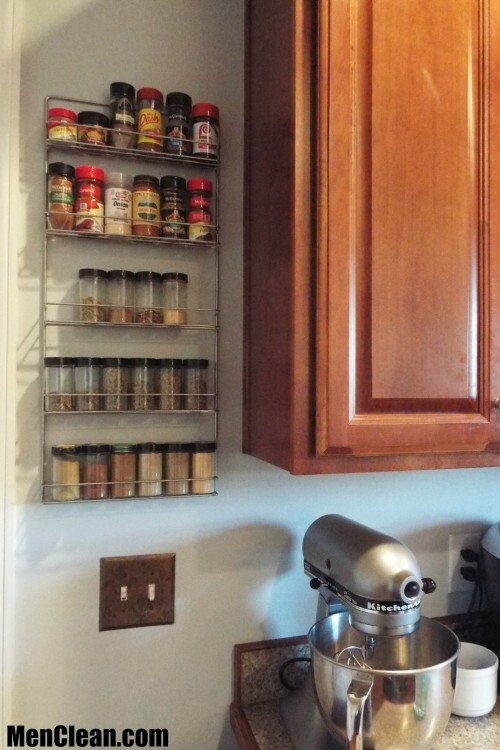 Also you could look for little shelves that are meant to hold picture frames to hold all your spices too. Doing this and organizing your spice rack or cupboard can save you time and a lot of aggravation when you are cooking! Do you like to bake?? If so then this station will be your best friend! Keep your electric mixer, bowls, rolling pin, parchment paper, measuring cups and spoons all together in one cupboard near your work station. You will want to have all your mixing spoons, rubber spatulas and other baking utensils in a canister on the countertop so you can grab them quickly when you need to scrape down the mixing bowl. You will also want to have near you the baking powder, baking soda, flour and sugar. You can even use small canisters especially if you bake a lot. Of course you will want all your pie pans, cake pans, cookie sheets and cooling racks handy too! Keep your timers near the over as well. We got one that has a magnet and it sticks on the oven hood. Doing all this and by keeping all the things you use within reach will make it a lot easier when you are making all those pies and cookies this Holiday season! Have a portion of your kitchen meant for the aftermath! After a meal, you will want to clean up as quickly as possible and relax so keep containers to put away all the leftovers. Keep your containers, plastic bags, foil and plastic wraps in the same location and usually its best to keep them near your sink and dishwasher that way you can store it then put it in the sink or dishwasher to be cleaned. There are so many storage bins you can install inside a cupboard or pantry door to stock boxes of storage bags, plastic wrap and foil so its easy to access. If you rather use plastic containers, you will want to use a shelf or bin nearby. Keep a container and spoon to put the leftovers right from the table before you set the casserole in the sink to soak . If you can easily move your leftover from the table to the fridge or freezer, the chances of getting the chore done quickly increases which allows more time for family! Use the cabinets above your dishwasher or beside your sink for dishes and glasses. then beside that use the nearest drawer for silverware. If you have extra head-space in your cabinets, use them for small juice glasses, coffee mugs and those tiny dessert bowls we rarely use. By keeping the items you use the most often close to the sink or dishwasher you will be more likely to get the dishes washed and put away simply because they are closer and more organized. If they were all scattered around, they would put off until later making your kitchen more cluttered looking. 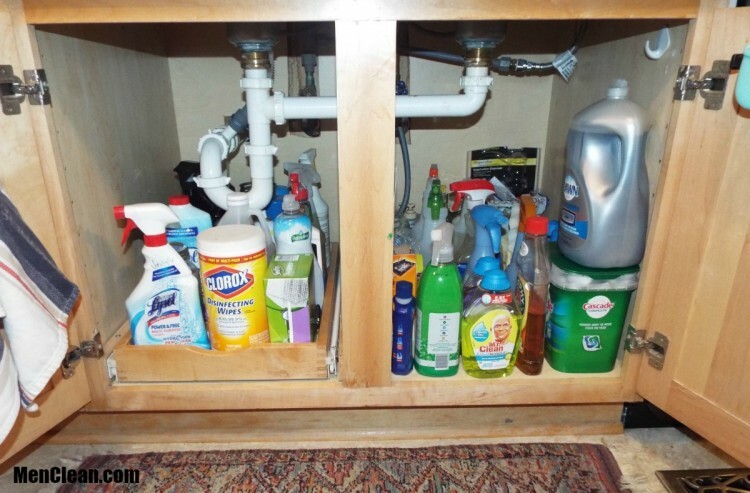 Keeping all your cleaners, soaps, scrubs, sponges and dishcloths under the sink is a great idea, as long as you have some kind of lock on the doors to keep out kids and pets! You can also put them in a utility closet if not. Also try using a plastic bin or bag with a handle so you can grab it when you are ready and carry it around the whole kitchen. There are items that we do not use everyday. 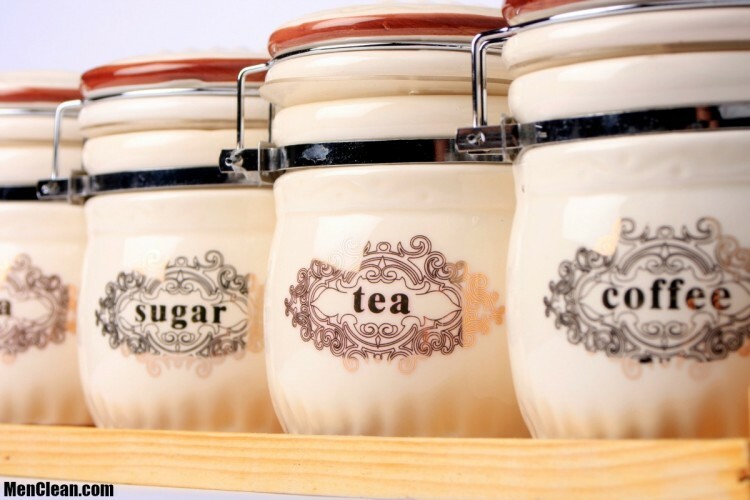 These can be stored in a buffet, china cabinet or bottom of the pantry. Storing your tablecloths, napkins and other tableware in these location is a great idea because they are close but won’t take up valuable storage space. Storing other dishes or appliances here as well is smart if you only use them once or twice a year. If you aren’t cooking and serving with it often, Move It! Some station aren’t apart of the cooking. You may want a coffee or tea station if that is apart of your morning or afternoon routine. Many people also use their kitchen to sort mail and keep the family calendar, or the never ending grocery list and to do list. Besides the kitchen sink and dish cleaning area, many kitchens have other cleaning supplies, such as a mop, broom, buckets, scrub brushes, dusting rags and all the polishes and sprays. Find one place to hold all of these so you aren’t running all around trying to get what you need when you have a mess you are trying to pick up quickly. We know not all kitchens are the same so depending on the size of your kitchen. You may or may not be able to implement all these ideas. But check out and do what you can. 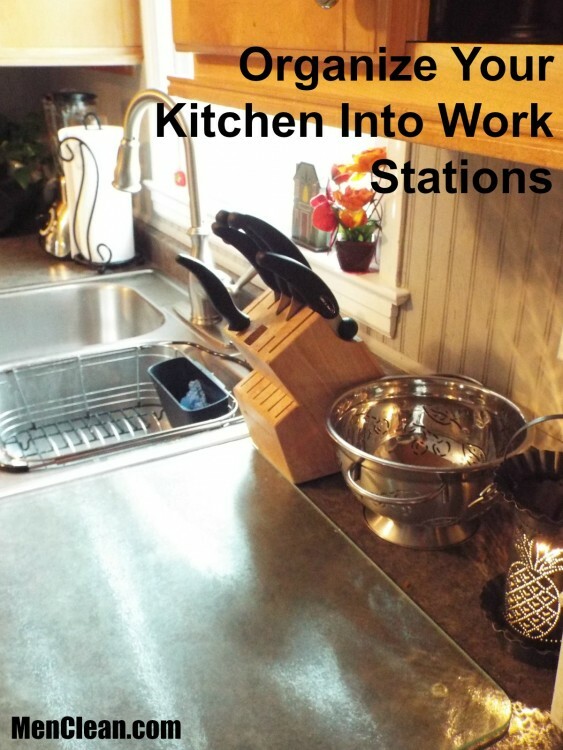 By organizing your kitchen into station even if they are small stations you can make your kitchen work for YOU! Tell us what you think and send us a picture of your new stations. We love to hear from you!